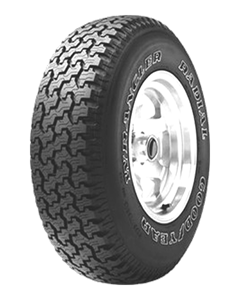 The Wrangler Radial tire was developed specifically for modern vehicles with four-wheel drive, operating both on the road and in the field. Perfect for rough terrain with a unique tread pattern that quickly removes mud from the wheels for maximum traction even in the most demanding times. Self-cleaning grooves disperse water from under the tire, mud and snow, effectively preventing the occurrence of the phenomenon of aquaplaning. SilentArmor technology allows Wrangler Radial tires allow for smooth over rough terrain off-road without damaging them. The internal structure of the tire is fitted with two layers of Kevlar fiber developed by DuPont, increases resistance to punctures and cuts. In addition, damping layer helps to absorb noise generated during the rolling of the tire on the road, greatly increasing comfort. Moreover, the system of massive blocks ensures driving stability and precise steering response, providing maximum control of the vehicle in all kinds of terrain and weather.